Chaos reigns but, curiously, things still get done. I’m a productive person who is deeply lazy, so I’m open to any and all hacks that make my life easier. This is a small selection of my quick and dirty research tricks. These tricks save me time and, if I can be honest with you, I use them even when I’m not very busy. I share some of these with you in hope that you will share some of your own in the comments. Librarians are good at helping you to design a search strategy and refine keywords, but they are also usually helpful souls who go that extra step without being asked. I must have a pathetic tone of voice or something because, after a phone call, it’s common for one of these dear people to send me a comprehensive list of databases, suggested search strings, and even a few references with which to get started. I feel vaguely guilty whenever this happens, but those lists are like GOLD, my friends. Do librarians come straight from heaven? I think they must. I’m not a complete slob when it comes to managing my references but, since I co-author most papers, the ‘cite while you write’ function uses up more time than it saves. I’m constantly moving between Scrivener and Word, throwing the paper to my co-authors on email, and so on. I’ve learned from experience that bundling and unbundling the references is just more trouble than it is worth. So, whenever I talk about another author in my paper, I put their name and the date in brackets. Later, I do a quick search in Google Scholar, locate the reference and go straight to those blue text options underneath. At the end there is one labelled “more”, click on it, and an option will pop up called ‘cite’. 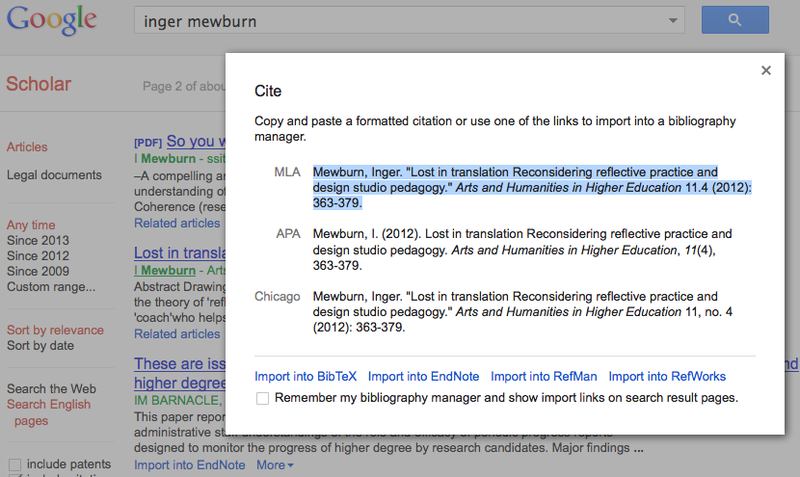 Click on that and the citation will appear, fully formed in APA style, in a pop-up window (see the image on the left). Cut and paste the reference text straight into your paper – you can always reformat it to another style later. Likewise, if you’ve been too sloppy to note page numbers of quotes from books, cut and paste the text into Google Books to find the page it appears on. Bless you, Google, you are truly the researcher’s friend. A caveat: this trick does not work for thesis writers. That way lies madness. Use a reference manager! Twitter solves almost all my professional problems. A politely worded query with a ‘Pls RT’ at the end will travel around the globe in no time flat. Someone, somewhere, will turn out to be an expert on the topic you are interested in and, if you are lucky, they will send you their whole library of references (this has happened for me – more than once). There are ‘channels’ on Twitter where you are sure to find researchers hanging out, eager for a bit of productive procrastination, who might turn their considerable brain power to solving your problem. If you haven’t yet discovered the treasure trove / brains trust that is #phdchat or #ecrchat, you are seriously missing out. I feel a bit ashamed to admit this, but when it comes to studies which use statistics, I almost never read the whole paper. I’ll read the abstract for the method and key points, skip straight to the results section for the goodies, then go to the conclusion to see if there’s anything I missed. Once I decide the paper is worth the effort, I go back and read more deeply. With edited books I always, always read the introduction diligently and look through the index to decide which chapters are worth my time. I electronically search articles for terms like “found”, “conclude” or “argue” to see if I can get directly at the meat without having to read the vegetables. I’m not averse to papers that are difficult conceptually, just those which are poorly written. I won’t stick with a paper long if it’s just too much hard work. I scan-read most of the time, using a ruler or my finger to ‘drag’ my eyes down the pages faster. I sometimes feel guilty that I am not indulging in leisurely, deep reading all that often… You won’t tell anyone, will you? Look, any researcher who claims they never use Wikipedia is lying. Wikipedia is a great starting point when you are researching background information, by which I mean information that helps you understand concepts and theories that you encounter in other people’s work. In fact, I think we should stop being snobby about Wikipedia and dedicate some more of our collective scholarly energies into improving it. I heard of an undergraduate teacher who, instead of setting essays, set their students to clean up and add to Wikipedia entries – a great idea, but I digress. Other ‘basic’ resources are helpful, too. I find books written for undergraduates on famous theorists or philosophers are surprisingly helpful because they cut through the crap don’t waste time building sophisticated arguments; they just tell you what the thinker was on about. Likewise, books on writing and analysing data aimed at undergraduates are easier starting points before you tackle the ‘grown up’ texts. If you are embarrassed to be seen with them on your desk, scan relevant pages at the library shelf using an app like ‘camscanner’ and send them straight to your Evernote database. Children are taught how to learn stuff in online environments these days and often make better use of them than us grown ups. You can probably learn stuff by watching your children, or nieces and nephews, do their homework. Thesiswhisperer Jnr, like many young men, is a fanatical Minecraft player and will spend hours watching ‘walk through’ videos. I’ve adopted his habits and now routinely use YouTube as part of my information foraging. 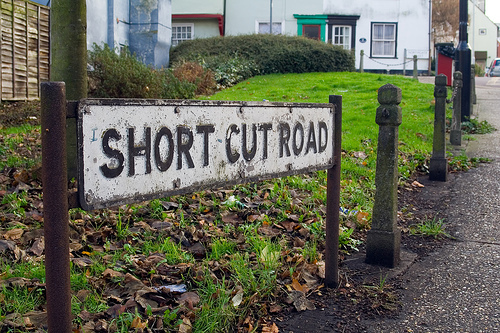 It’s great for technical stuff like formatting things in Word but I’ve recently discovered that there are many great ‘walk throughs’ on all sorts of subjects. The Khan academy does great work explaining science in bite-sized chunks. In the humanities, there are lectures by key theorists and even short features on key thinkers and concepts. For some reason, a YouTube video is like a knowledge injection for me: the facts go in quick and deep without the long digestion period I need to get information from text. So, that’s a few quick and dirty tips from me – what about you? Have a tip or two to share? Love to hear them in the comments! Comment from a librarian on point 2: make sure you double check the reference! Google is “clever” but the reference is only as good as the data and that is often flawed. I use Google cite myself but fix errors in almost every reference (it’s still faster that writing from scratch). This has saved my sanity! I am currently drowning in the need to format my bibliography in APA and it makes me want to cry–I have no time, and my wonderful RA is finishing his own thesis so I’m on my own… I’m taking the Google tip to Shut Up and Write tomorrow and might get the article done! I’ve been using Helen Sword’s ‘writersDiet test’ (http://www.writersdiet.com/WT.php) to help me identify problems with my first draft. I’m finding it helps speed up the trimming down of e.g. too many nouns or prepositions! Totally agree on Wikipedia, obviously I’d never cite it, but it’s a great starting point. It’s also really useful for the occasional ‘everyone knows this’ fact that you need. I particularly use it for finding out the family/order of a particular species. “Any researcher who claims they’ve never used Wikipedia is lying” — THIS and THIS — “I almost never read the whole paper”. Finally someone talking some sense! I’ve gotten sideways looks from others when I’ve mentioned both these points which used to make me feel like was doing something wrong. Now I’m too busy to care. Thanks for blogging about this! For books, I have Ottobib extension on my browser so I can just paste in the ISBN (from Amazon) and get one of a number of formats. The only gotcha I’ve found is that it isn’t always accurate (which may be where Google is better). Great post. Never occurred to me to ask Twitter, but I shall do so now. Twitter is great. You might want to have a look at Narelle Lemon’s article on Personal Learning Networks for more on this topic.